SANTA CLARA — The Packers took control of the game in the third quarter and led the 49ers, 17-3, with one quarter to play at Levi’s Stadium on Sunday. The defense forced a punt on the 49ers’ first possession of the second half, and the Packers had the ball at their 39-yard line. On third-and-9, Aaron Rodgers threw to old reliable, James Jones, for 11 yards. On third-and-7, Rodgers to Jones converted again, this one for 38 yards to the 49ers 8. On the next play, Josh Sitton was flagged for holding and the Packers moved back 10 yards. On second down, Rodgers scrambled to the 1-yard line. John Kuhn scored on the next play; the Packers led, 14-3, with 7:10 to play in the third quarter. The Packers defense forced a three-and-out, causing Clay Matthews to kiss his right bicep in a mock gesture of Colin Kaepernick. 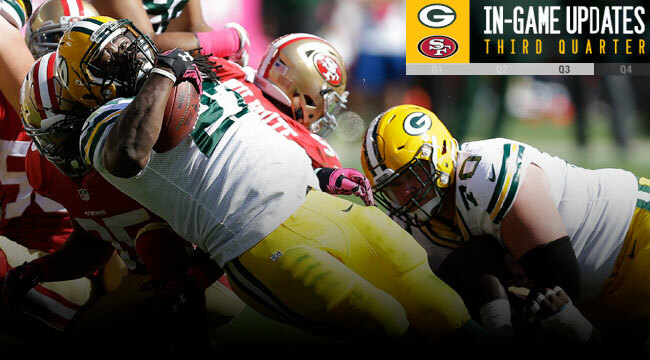 A short punt left the Packers with the ball at the 49ers 48, and in firm control of the game. Eddie Lacy ran for 12 yards to the 16 and the Packers were on the verge of taking a commanding lead. The 49ers defense stiffened, however, and Mason Crosby came on to boot a 31-yard field goal, 17-3, with :45 to play in the third quarter.